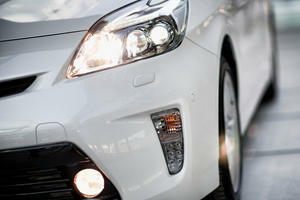 With SUVs becoming ever more popular, even standout sellers like the Toyota Prius have started to feel the burn. Consumers have made it clear – we want a higher ride height and all-wheel-drive traction to get us through the winter months. Oh, and 50 miles per gallon wouldn’t hurt either. Looking around at the hybrid segment, no automaker seems to have answered this call to action. Sure, the Kia Niro does have an elevated ride height, but it doesn’t offer any form of AWD. Enter Toyota, who have. Along with a pleasant facelift, the 2019 Prius now sits in a class of one. If you want an AWD vehicle capable of achieving over 50 mpg, this is your one and only choice. 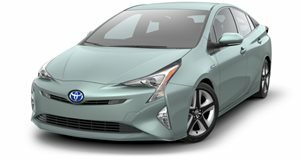 Toyota expects the AWD Prius to account for 25% of all Prius liftback sales, so this will clearly be a popular option among consumers. In an effort to be as fuel-efficient as possible, the Toyota Prius has never been what we’d call a beautiful car. When the fourth generation arrived for the 2016 model year, our muscles tensed up at the very sight of it. While the third generation wasn’t exactly pretty, its lines were inoffensive. Looking at it didn't hurt your eyes. Toyota has softened up many of the fourth generation’s lines even more for the 2019 model year. The biggest changes lie with the headlights and taillights, which have been redesigned to look less funky. The 2019 Prius still won’t win any awards for styling but we have to give Toyota props for a majorly successful mid-cycle refresh. The carmaker continues to offer exciting colors on many of its new models, including two new colors called Supersonic Red and Electric Storm Blue on the 2019 Prius. The biggest challenge with the AWD Prius was striking the right balance between increased traction and stellar fuel economy. To this effect, the Prius won't be able to conquer Moab anytime soon but it will be able to tackle a snowy hill. Toyota says the Prius AWD-e will be able to achieve 52/48/50 mpg city/highway/combined, which is only off by two mpg in each category compared to the FWD model (in equivalent grade levels). The most efficient FWD L Eco grade can achieve 58/53/56 mpg city/highway/combined. In order to keep those excellent fuel economy figures, Toyota has used a unique type of AWD system called AWD-e (the 'e' stands for electric). This system employs a rear-mounted, independent electric, magnet-less rear motor to drive the rear wheels. Since the motor is magnet-less, it can decouple from the drivetrain when it isn't needed so it doesn't place any drag on the car. When you first hit the accelerator, the rear motor will always provide power from 0-6 mph, supplying traction off the line. Then, the system can kick in when needed at speeds up to 43 mph. The rear does add 7 horsepower and 40.6 lb-ft of torque, though it doesn't do much to aid performance. You can feel a slight increase in readiness off the line, though once it is underway, the AWD-e model feels like any previous Prius. Don't expect any increase to the car's usual output of 121 hp or 0-60 mph time of over 10-seconds. If there is any performance benefit, it will likely be canceled out by the gain of 145-170 pounds for the AWD-e system. Interestingly, Prius models with AWD-e employ a Nickel-Metal Hydride (Ni-MH) battery instead of the Lithium Ion battery found in FWD models. This change was made because the Ni-MH battery is more resistant to colder climates, so it will perform more effectively in snowy conditions. 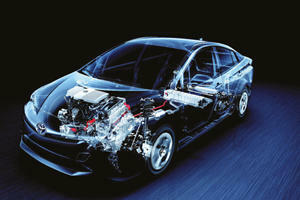 Both drivetrains are still mated to Toyota's 2ZR-FXE 1.8-liter four-cylinder engine sending power through a CVT. Inside, the changes to the 2019 Prius are minor, yet effective. All Prius models have a central, 4.2-inch multi-information display to show the energy monitor, hybrid system indicator, AWD monitor (on AWD-e models), climate control, audio content, navigation content (when equipped), and various eco readouts. This can also be paired with an optioned head-up display (HUD) for those who prefer to have information directly in front of them. Below the central display, most 2019 Prius models utilize a standard Entune system with a 6.1-inch touchscreen with six speakers, an auxiliary audio jack, one USB 2.0 port and two USB charge ports, advanced voice recognition, Bluetooth, Siri Eyes Free, and a backup camera. The screen feels extremely small by 2018 standards and feels very basic, but it gets the job done. The top Limited trim (which isn't available with the AWD-e model) includes a larger 11.6-inch HD display with JBL audio and navigation. We and found its lack of volume knob and physical controls to be frustrating. Even though the base system feels dated, it is still the one we'd want to use every day. Toyota has also made a few minor changes to the 2019 model's interior layout and materials. The old white plastic is no longer available, replaced by a piano black finish. The optional Qi wireless charger has also been made larger and the heated seat controls are now much more accessible. Buyers of the XLE trim will enjoy a SofTex-trimmed heated steering wheel which features temperature-regulating properties to make it feel more comfortable in hot or cold weather. Rear seat occupants will also enjoy two new USB charging ports. Part of the challenge with the new AWD-e system was figuring out how to maintain the Prius' ample storage space. With the rear seats in place, the Prius AWD-e offers 27.4 cubic feet of cargo space, which can be increased to 62.7 cubic feet with the 60/40 folding seats lowered. Toyota maintains this is more than most SUVs and is by far the best for any hybrid vehicle with AWD. True adventure seekers will also be able to purchase Genuine Toyota Accessory cargo crossbars for roof rack attachments to carry large objects such as bikes, kayaks, or snowboards. Perhaps not unsurprisingly, the 2019 Prius doesn't feel much different from behind the wheel than the previous model year. At normal driving speeds, the AWD-e system doesn't play much of a factor. You can only really feel its impact when launching or in snowy conditions. Toyota flew us out to sub-zero Wisconsin to test the car's AWD capabilities but sadly, there wasn't any snow on the ground. Fortunately, the folks over at Toyota created a closed ice-driving course where we could feel how well the AWD-e system works in action. We were told to stop the car on a snowy hill, then press the accelerator. I decided to mash the throttle to see if I could flummox the system but it easily got me up the hill with no issues. The AWD-e system certainly impressed, though I can't say the same for the rest of the car. It still drives like the last Prius I drove, meaning light and uninvolving steering, copious amounts of body roll, and sluggish acceleration. I've certainly driven rivals that are more enjoyable than the Prius, namely the Kia Niro and Honda Insight, though neither of those cars offers AWD. The Prius still boasts a compliant ride and the gas engine, while intrusive, isn't as coarse as the one in the Honda Insight. , which may offer improved dynamics and more pleasing looks than the Prius. It will also offer an estimated 50-mpg combined and is rumored to be . If the Prius' styling and driving dynamics just don't do it for you, the Corolla Hybrid may be worth a look. For the 2019 model year, Toyota has in favor of more conventional ones inline with the rest of Toyota's model lineup. The Prius now offers four distinct trim levels, two of which can be had with the AWD-e system. The base Prius L Eco starts at $23,770 while the LE starts at $24,980, the XLE at $27,820, and the Limited at $32,200. The LE AWD-e and XLE AWD-e start at $26,380 and $28,820 respectively, . I drove an Electric Storm Blue XLE AWD-e model, which was equipped with a HUD, heated leather seats, a heated steering wheel, a Qi wireless charger, and host of standard safety features. All 2019 Prius models include Toyota Safety Sense P, which bundles pre-collision warning, pedestrian detection, lane departure warning with steering assist, automatic high beams, and adaptive cruise control. For a modest $1,000-$1,400 premium and only a two-mpg loss in fuel economy, the AWD-e system seems like a good deal. Anyone who lives in a cold climate but wants to see over 50-mpg will almost undoubtedly want to opt for a Prius with four-driven wheels. The 2019 facelift hasn't dramatically changed our opinion of the Prius but it does clean up what was a very controversial design. Along with some other minor improvements on the interior, we'd call this a successful update. The addition of AWD is enough to help the Prius stand out against its FWD-only rivals and is also enough to give it a rating of Worth A Look.